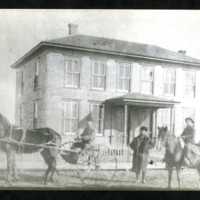 This image appears reversed in "Hesston Centennial," page 10, with the caption, "Residence of Chris Wenger, first Veterinarian in Hesston, KS. 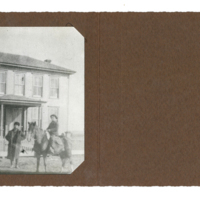 He built a livery stable at 137 N. Main St, Hesston, Ks. Mrs. Wilson (Mary) Stratton; Mrs. Dearmin (Sylva) Dillman; Mrs. Suzie Howard; and Mrs. William (Ella) Hoffman were his daughters." 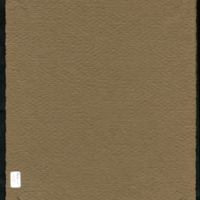 unknown, “Chris Wenger's house,” Hesston Public Library, accessed April 19, 2019, https://hesston.digitalsckls.info/item/1670.